HomeDigital MarketingWhat Is Google Instant and How Google Discontinues Instant Search? What Is Google Instant and How Google Discontinues Instant Search? Google Instant was introduced with promise to be a revolution in the way how we deal with search engines. At the beginning stage, it was even termed as “fundamental shift” of search engine. However, later Google had to decide to close this search engine feature permanently. Those, who work with SEO Services or PPC or web marketing campaigns, should understand about instant search. Nevertheless, it is also important to learn why Google has closed this feature permanently. This article shall discuss various aspects of Google Instant. We shall also find salient features that Google Instant had in offering for the users. Back in the year of 2010, Google had announced launching new feature which had been termed as Google Instant. So, what is this feature all about? How it works and who could be benefitted? Is there any way of turning off the feature? To find suitable answers to these questions, we need to get back to the basics. When you perform a search on Google, you shall find that based on your typing Google suggests some probable keywords. Along with these probable keywords, Google shall also open up a drop down search result. That means you do not have to complete your typing, you shall get the search results at the drop down section. This drop down search result has mainly been noted as Google Instant. According to Google, this feature comes with three major benefits in offering for the users. These benefits, as described by Google, have been listed below. Firstly, it is a time saving option. It saves your time in searching for the information that you need. With this method of searching, Google predicts your search smartly. Thus, Google’s assist pleases you to the next level. It enhances overall user experience. Without pressing or hitting the search button, users can check the search results with ease. How Can People Avail Google Instant? Google Instant has been initially available for a few countries only, including in the USA and UK. However, it was rolled out for others soon. You need to have browsers like Google Chrome and Mozilla Firefox to avail this facility or feature from Google. However, many other browsers support this feature from Google as well. Mobile browser users would not get this feature though. The feature is only available when you conduct a search through home page of Google. Once you reach the search result and you enter new search, you would not find Google Instant Search Result feature there. The feature would not work in the following cases. When you are using Google SSL search. When you have already disabled auto complete feature of Google. When you are using Google toolbar for your web browser. The instant search result feature can be disabled. So, when it does not work on your search engine, it probably shows that the feature has been disabled. When you access Google search from other places or search bar hosted in other website. Google Instant is basically a localized search engine algorithm and Google Trends. So, the predictions, which you shall find on the Google Instant, are basically chosen from the regional Google results for particular keywords. So, when you search something from India will not be similar to your search result on Google Instant from the USA. Google Instant predictions will vary as per the users’ location. This is an important feature of this newly introduction option from Google. Google Instant search results are also personalized. Based on your previous searches, Google manipulates your preferences. The websites that you open frequently and the key terms that you search repeatedly will be found on the search engine. If you use content filter for Google search results, it is better to turn off Google Instant as it does not follow your content filtering restrictions. So, overall Google Instant works quite seamlessly or conveniently. It is robust and quite popular among the users. There are many users too who do not like this feature of Google. They can simply turn this feature off. To turn it off, you can follow the tips as provided below. What Is the Procedure to Disable Google Instant? If you do not like Google Instant, you can simply disable it. To do that, you just have to follow some simple steps. Those steps are discussed below in step by step manner. At first, you need to go to the home page of Google. At the home screen of Google, which is pretty simple and minimalistic, you shall find a search bar. Beside that bar, you shall notice a small text, written in blue, saying “instant is on”. Now, you need to click on this link, and then toggle between “on” and “off” options. There is an alternative method of doing the same step, and this method has been as discussed below. You have to open your web browser and then go to the setting page. You need to go to your search preferences page, and there you shall find option for Google Instant. You can choose to turn it on or off, as per your desire. Why ‘Google Instant’ Is Discontinued by Google? 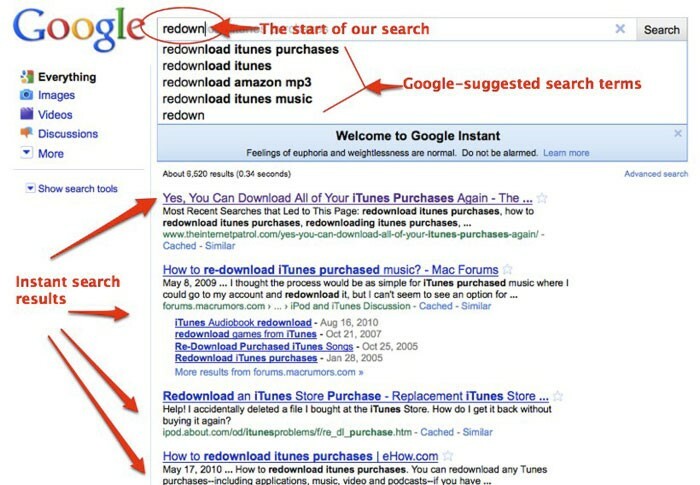 Google has found that Google Instant has not brought all the benefits that were expected from it. It eventually saved time in finding the search results, but users have the habit of hitting“enter” button after they finish typing and go to original search page. It is also easier to navigate traditional search result page than the Google Instant. Another important thing is that Google Instant is a little slow to load, and users do not have such time to check instant results. They simply go to main search page. Google Instant has been discontinued by Google due to many other reasons. It has an impact over the SEO and PPC Services, since it always show personalized and localized search results. For certain section of the businesses, this kind of search algorithm was a little difficult to cope with.